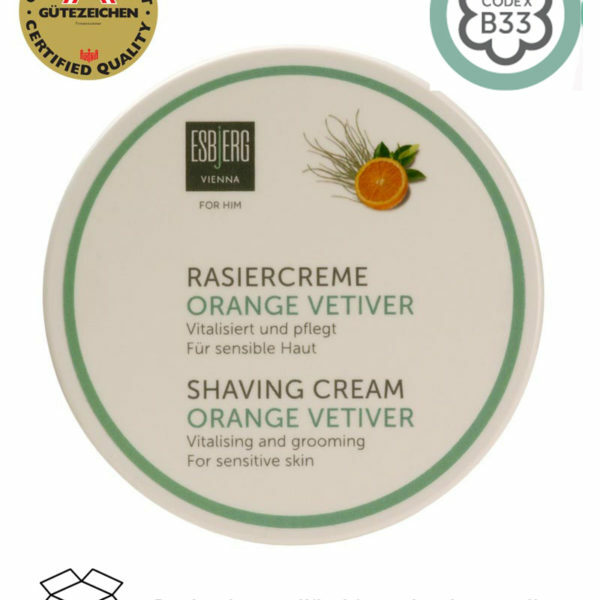 This Shaving cream thoroughly cleans and revitalises tired, stressed skin. The contained minerals and trace elements optimally prepare skin and beard for wet shaving. With the wonderful smell of Orange and Vetiver. Saponification of stearin is used to produce Esbjerg’s shaving cream. Saponification is an old traditional and complex process, which creates the unique texture of classic shaving creams. The result of this cumbersome procedure is outstanding: shaving creams with perfect texture and lather properties that do not contain any detergents. Ingredients such as coconut oil, essence of rosemary and of sage perfectly support skin barrier, are antioxidants and have anti-inflammatory effects. 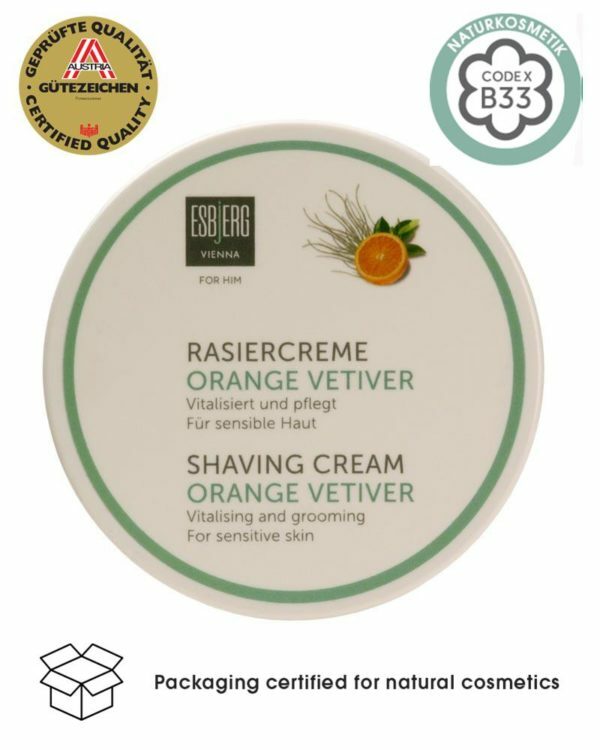 Orange and Vetiver create a perfect harmony for your skin. The scent is an invigorating combination and has a stimulating effect. Orange oil is a very warm scent. The oil is stimulating and brightening up your mood. The orange oil has an astringent and antiseptic effect on the skin and relieves irritated skin. Vetiver is a sweet grass, whose roots are used for obtaining the essential oil. The scent is a mysterious composition of woody and earthy fragrances, intense and herbal. Vetiver revitalizes and regenerates tired skin. Wash your face and neck with hot water. Use your hands or a shaving brush to work the shaving cream into a lather and apply it to your face. Let the lather rest for one or two minutes. Then drag a sharp razor across the skin to shave. Applying pressure is not necessary. When you are done, rinse the face with fresh, cold water. Apply aftershave for an extra smooth feeling. Very good texture and beard softening properties. The resulting foam ensures a close shave. Ideal for my sensitive skin. Exquisite scent!